All transactions are safe and secure with a reliable history in online purchasing behind each of our associates. 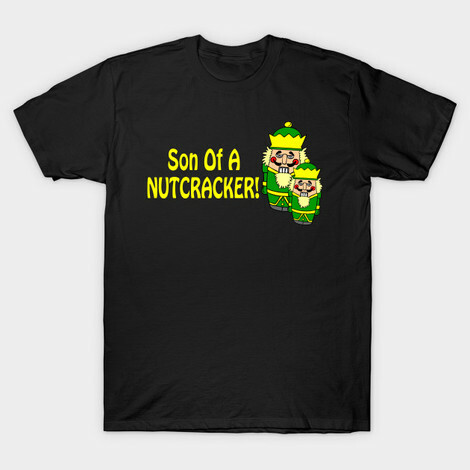 Buy the Son of a Nutcracker Elf t-shirt to own Elf clothing and merchandise. This design displays the Son of a Nutcracker quote from the Elf movie. It's the ideal expression to use after you've been pelted in the head with a snowball. With the help of Buddy's snowball making skills and machine gun arm, it will be easy to exact revenge on your enemies, one snowball at a time. The design also features a holiday nutcracker figure and his son with elf costume colors. Crack some nuts in this Will Ferrell Elf tee that's perfect for the holidays or any time of the year. In addition to the Son of a Nutcracker Elf tee above, browse the Elf Clothing Gallery for more apparel like men's and women's clothes, kids shirts or hoodies.